The Unix Curmudgeon has been quieter than usual, lately. It’s the political season, as the campaigns heat up, and we have resisted going off on a tearing rant on the idiocy of our politicians and the people who vote for them for all the wrong reasons. Work has been slow this year, for various reasons, but is starting to build. We’ve put off bicycling way too much, due to hot weather, busy activity schedules, until there is an urgent need to build miles to prepare for the end-of-season infamous “Birthday Ride,” in which we ride our age in miles in one day, a feat that is, as the years pile up, becoming a dawn-to-dusk adventure. The Nice Person has long since given up supporting this insanity on the tandem, claiming she is too young to ride that far. But, that’s going well, having completed the metric equivalent, solo, as a “training ride. Which burns a lot of calories. Which brings us to the subject of food. Preparing meals and special dishes is a particularly rewarding, human thing to do to dispel the angst of politics and the burden of work and as a reward for physical activity. We haven’t been doing enough of that lately, to the point where the Nice Person has actually dragged out cookbooks and recipes, claiming we couldn’t possibly face yet another take-and-bake pizza, which has been the staple during this summer’s inundation of bicycle tourists, whom we enjoy and are an inspiration to us. Someday we may suddenly give in to the urge to just get on the bike and ride over the horizon and beyond. We also rearranged the kitchen slightly, with the addition of a recycled small cabinet to replace or rather, augment the table that was next to the stove. The table was liberated to become a bookcase for cookbooks, and the cabinet that held cookbooks now holds stored food that was squirreled away. Thus we discovered we had a rather substantial supply of black rice. After whipping up a batch of sticky rice, which our latest guests enjoyed, I decided that it was worth repeating. It’s a good dessert, full of fat and sugar like most, but a lot of work, so we feel we deserve it. In the process, the recipe and method has become my own, so we’ll present it here. 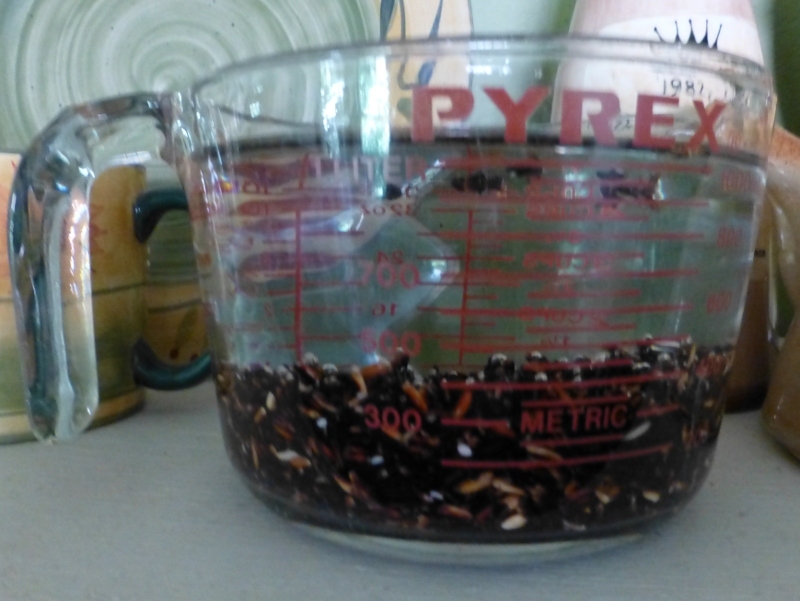 First, combine one cup (188gm) of black rice (available at Asian food markets and some gourmet shops) with four cups (900ml) of water. Let soak for at least six hours, overnight is better. Gradually, the water turns purple. Although it is called black rice, the water turns purple as the rice soaks. This is after about four hours. I left this batch soak for a full day. The soaked rice, ready to cook. 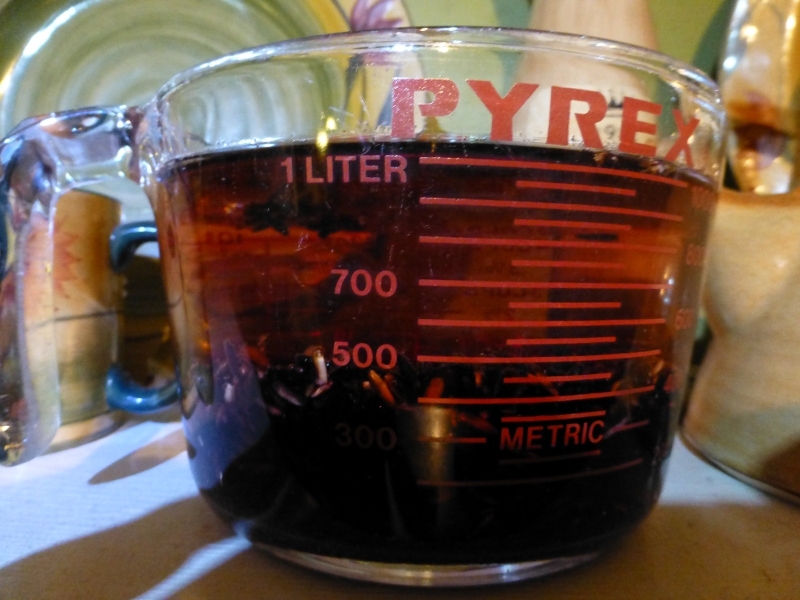 When the rice and water is put into a 3-quart sauce pan, the water turns a deep aubergine. The rice is brought to a boil, then the heat reduced to a very low simmer, for one hour. I cover the pan for the first 45 minutes, then uncover and stir occasionally for the final 15 minutes. The rice should be cooked, soft, but not yet sticky. Now comes the labor-intensive part. But, it doesn’t have to be, if you have time. By accident, I discovered if you cover the pan and let it sit for 30 minutes to an hour, the rice will thicken quite a bit by itself, without stirring. At this point, either while the rice is still hot or after letting it thicken for a while, add a cup (240ml) of light (fat reduced) coconut milk and half to 3/4 cup of sugar. I use confectioners sugar, but any kind will do. The original recipe called for paneer, which is a palm sugar sold in Asian groceries. The Thai recipe also calls for an aromatic leaf added now or vanilla extract at the end, but I don’t bother with either. Bring the mixture back to a boil while stirring constantly. 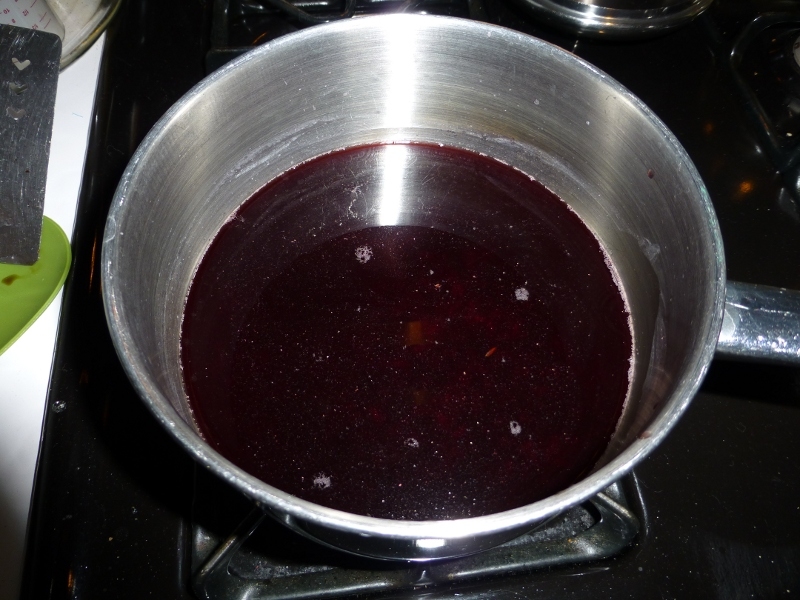 When the mixture boils, turn the heat down to prevent sticking and continue stirring until the pudding is quite thick and the surface has a shiny appearance. Depending on whether the rice was allowed to rest or not and how much sugar you use, this will take between 15 minutes and an hour. If it isn’t thick enough by then, a cornstarch paste can be added, but it is better not to. Add the vanilla if you had decided to use some and stir it in. Ladle the pudding into serving dishes and chill, or let cool and serve warm. If you can find it and don’t mind the extra calories, each dish can be topped with a dollop of coconut cream (again, see your local Asian grocer) immediately before serving. One batch makes approximately six half-cup servings. The pudding has a smooth texture and can vary in sweetness. 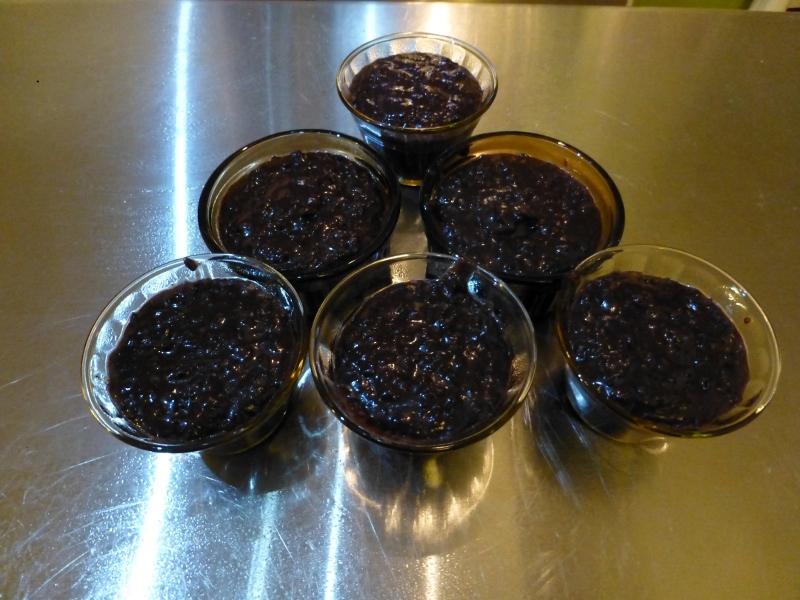 The color is the most striking feature, making black sticky rice a distinctive dessert that complements most meals, not just Thai cuisine.